For additional resources that explore the use of existing Medicaid authority to support approaches that link clinic to community prevention to address chronic disease, please see materials on the Nemours website. The Nemours resources include a roadmap with over 40 examples from states doing innovative work; planning tools for states; three in-depth case studies; and a white paper describing the accelerators and barriers to, and lessons learned from this work. 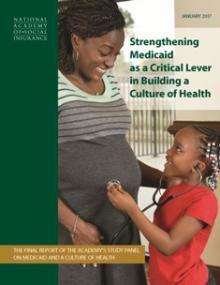 Strengthening Medicaid as a Critical Lever in Building a Culture of Health is a nonpartisan study panel report which offers a series of steps that would enable Medicaid to leverage its unique role as an insurer to increase its capacity for addressing the underlying social determinants of health. The study panel was convened to assess the current and possible future role of Medicaid in building a Culture of Health. The panel included state Medicaid program directors, public health and health policy experts, health researchers, medical and health professionals, and health plan representatives. The panel discussed strategies that could increase Medicaid’s potential to help move the dial on individual and population health, while improving health care quality and program efficiency. The findings are divided into two categories: those that can be accomplished administratively (without any further legislative action) and those that would require legislative change. The report also recognizes key challenges that Medicaid faces, including the high cost states already bear for insuring vulnerable populations, the chronic insufficiency of funding for social service programs that could partner with Medicaid to foster health, and the complexities of implementing innovative care delivery models, among others. While the current political landscape signals new policy discussions about the future of the program and its funding, the analysis and options included in this report recognize that health care coverage is a critical underpinning for improving health. Whether and how Medicaid might be changed, its role as an insurer is foundational; this report assumes that Medicaid will continue to be central to the health care safety net as an insurer of low-income, vulnerable populations.